Even though the sun has been really quiet this month with few flares to record. It's important to send in a report even if no flares were detected. Thanks for all your submissions! Please remember even if you detect no SID Events still send your report for no SID events! Thanks to all who submit their VLF SID reports each month. Thanks for all your contributions. Even though there are few flares to report, keep on monitoring the sun.. Even though folks do not detect a SID event, please still send either a blank report or an email. No detections are still good data! Only a few flares at the end of November, so we're glad everyone submitted their reports. See the LASP graph..
Only a couple C class flares recorded this month, but folks are sending in their reports. Thanks to all the VLF observers.. Although, there were not so many C class flares in January, thanks for all your reports. Thanks for all your submissions! 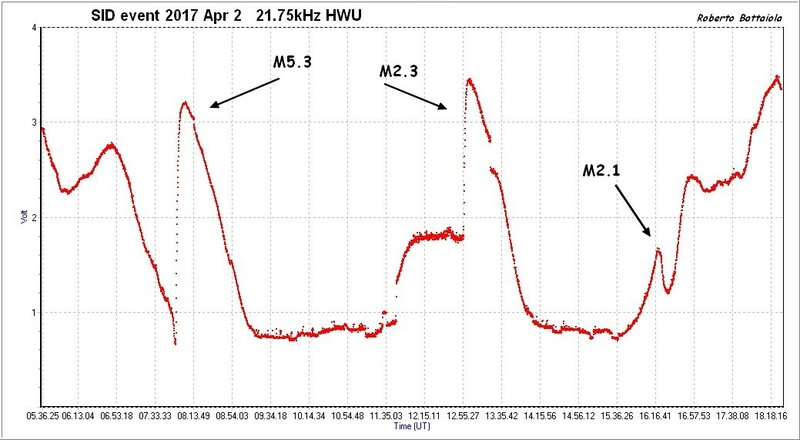 The sun is being creative and we have many flare events for April, so keep those VLF radios going. There were some good flares in early April, so check your records. Attached are a couple days, these from Roberto Battaiola. There were a few flares this last month, so keep on watching. Once in while we flares during the month, so keep on looking!! The sun is not giving up!! Yesterday there were many M class flares. Hi, I just went operational a few days with a SuperSID receiver from Standford. How can I use it to report here? There are things we need to know about your setup; size of loop, what OS you're using, what sound card, that sort of thing. Rodney I just sent you an email with the details, thank you! Rodney I just sent you an email with the details, I forgot to mention in that email that besides the SID receiver I have 2 Solar dedicated scopes, the first the Coronado PST , double stacked with a Coronado 2x solar Barlow and a Celestron Skyris Camera 236 M which I runn with a ripod mounted mini PC through with Sharpcap remotely controlled with Teamviewer and the other just for fun an old Meade ETX 80 with a "NASA" Solar Funnel projection system , the later although not to scientific it's loads of fun and can detect lots of sunspots when they appear..
We had X class flares earlier this September, you just never know what that sun is going to do!! Even if you don't detect a SID Event, please send in a 'no report' for the month. We're probably going into solar minimum and not likely to have many (or any) flares. There was only one observer this month (A142, Igor) who recorded a B7 class flare. 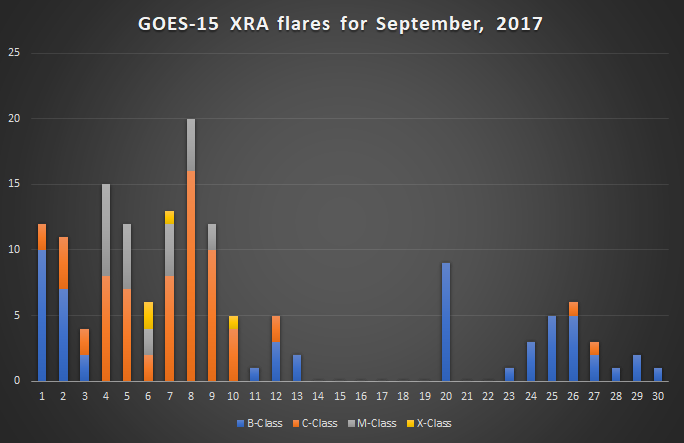 There were no C class flares for November!! 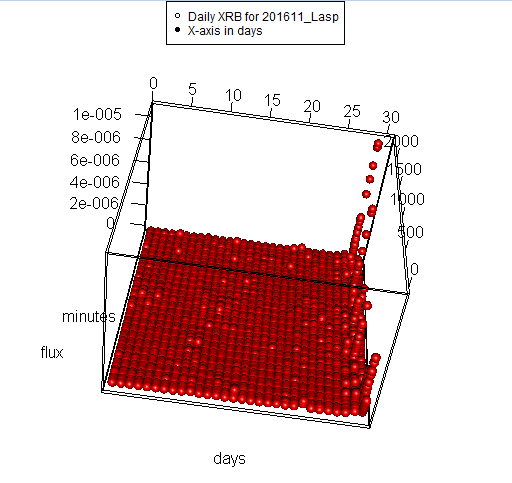 Only one flare event recorded for the entire month of December! All flares from GOES have been B class flares. But, keep observing.. So far there is only one flare reported by R. Battaiola (A96) . Please keep on looking! Solar activity is up and down, so keep on observing and collecting those VLF flares. There were a few flares this month, and we appreciate your monitoring the sun and the SID events. Very few data in the reports this month with almost not detections over a B8 or B9, but keep recording! and keep sending in your blank reports. Thanks for all your submissions, we did have some flaring this month especially on the 23rd and 28th of May! 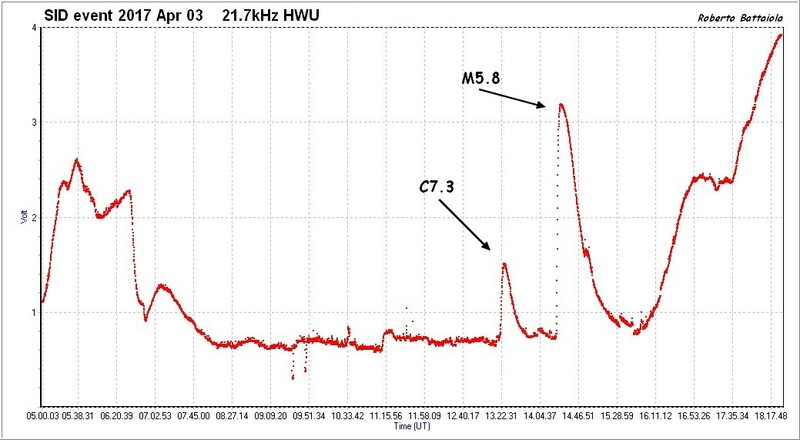 Only one C1.6 flare this month on July 6th (2000 UT), so many observers with no reports. But, that's OK!! Keep observing.